This field proven dashboard information system has a reputation for reliability. Its components are rated for in-cab use, and you have the flexibility of a modular system with standard or custom features. Single gauges, multi-gauges, and lightbar are daisy chained on the NGI bus, and controlled by the System Control Unit. 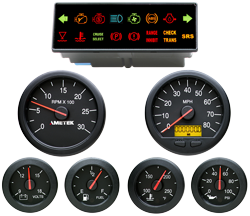 Modify gauges using existing or custom decals, various LED backlighting colors, and software configurations specific to your application. The System Control Unit (SCU) receives data from the vehicle data bus and displays it on standard size 3-inch or 5-inch gauges. It also receives inputs from discrete switches and analog sensors. It processes this data to drive telltales and gauges, display vehicle information or broadcast messages on the vehicle data bus. Customized vehicle instrumentation ranging from a few gauges to a complex, multiple indicator dashboard display can be created easily. NGI Gauges receive pointer data from the C-COM LMC or the SCU over an internal NGI data bus. The NGI data bus communicates vehicle information to drive the gauges, with just a daisy chain connection. Their look can be customized with a choice of bezels, and standard or custom decals. The Lightbar Message Center (LMC) and System Control Unit (SCU) are both part of the modular Next Generation Instrumentation (NGI) system that can satisfy the instrumentation requirements for all vehicle platforms. Both receive messages from the vehicle data bus, switch inputs and analog inputs, and process this data to drive telltales and gauges, display vehicle information or broadcast messages on the vehicle data bus.